Writing about Dwayne Johnson’s hands isn’t easy as most of his personality characteristics are well known to the world. He is an open person, perhaps that is why. What new character attribute can his hands reveal? Maybe one can find something on his hand that isn’t so obviously known or something which doesn’t fit his known personality. charisma, extroversion, openness, the high level of energy and generosity of nature. He is a people’s person although not demonstrative. When I said ‘energy’ it was an understatement. He is positively bursting with it and this kind of leaps out at you from his hand. There is negative energy present as well, which means moodiness and volatility. You can check out his hand photographs here and here. The picture of Dwayne Johnson given below is a free photograph. His lines are surprisingly normal and by normal I don’t mean average. I just mean that the three main lines of head, heart and life are long, clear and balanced with each other. The fate or Saturn line is good too. Well-defined, long lines, without a fine network of minor lines, reveal clear thinking and an intelligent, capable and stable personality. This is inherited, seen on both his passive and active hands. A life saver for a hand with such heavily developed mounts. 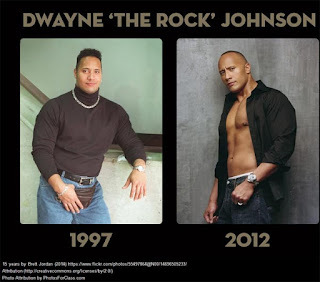 If Dwayne Johnson had such a turbulent childhood (apparently he was arrested several times as a teenager and was part of a gang) it must be something to do with his high energy levels. But he managed to channel this vital force (an inherited characteristic) productively and that is where his personality (as shown by the lines) comes in. He had the common sense to get back from the brink. Amazingly, he turned to exercise and bodybuilding to get out of depression, not medication. Something which only a sensible and goal oriented person is capable of doing. He could not have been who he is without a good upbringing otherwise his character would have changed, become unstable, and his right, active hand would have been very different. There was always the possibility of going wrong. There is one significant difference though. The Mars mounts on Dwayne’s active hand are less developed as compared to the passive hand, which shows that he managed to harness the aggression and control his temper. The third phalanges on Dwayne’s hand are not developed, and the Apollo (ring) finger on his hand dominates the Jupiter (index) finger – but not too much. The index finger is a little low-set and the Mercury (little) finger not too long. There is no doubt that there is some amount of humility, innocence or perhaps naiveté in Dwayne's character. When these qualities are combined with the passionate nature, it would make him endearing to people, adding to his charm. And then there is his openness, compassionate nature and a love for animals. Surprisingly, what his hand does not show is a desire for status symbols. He does enjoy his comforts but actually, he is the type who is able to bear great hardship and do without luxuries for long periods. That could perhaps be the secret of his ability to work so hard. 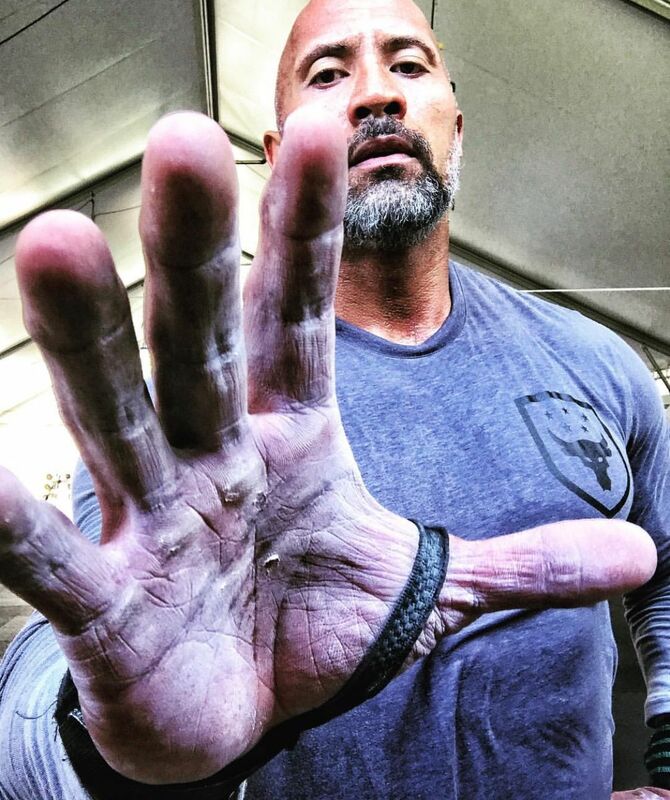 There is nothing ordinary about Dwayne Johnson’s hands. Yes, a lot of famous people are talented and smart like he is, but Dwayne has something else. Perhaps it is his strong inner vitality. Or check out the hand readings of other international players and Sports Stars from different fields like cricket and tennis or read about the personalities of Hollywood actors. I have one question regarding this article. You said his first and little fingers are low-set, how does this affect his personality exactly? And what would've been the case if these weren't low-set in regards to his personality? Also, an awesome palm reading. I wish you could upload weekly as I have to wait a long to read your readings. 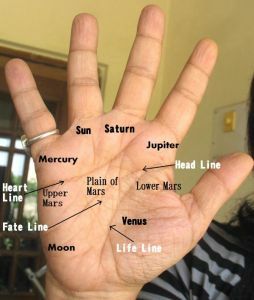 Hello Aspiring Palmist! Thank you for your comment. Glad to have you as a reader! I really wish I could post more often, but unfortunately there are time constraints. Regarding the low set fingers, if a finger is low-set, it reduces some of the qualities shown by the finger. I have devised my own system about how exactly it affects the personality( depending on which phalanges of the fingers are short/long and the overall length and shape of the finger and the strength of the mount below it) and am writing a book on it – two in fact. I know the books have been a long time coming but I have also written another book (not on palmistry) and therefore the palmistry books have got delayed. But because I want to put it all in a book, I avoid giving out specifics. Interesting. When will these books on palmistry be released? Any estimated date? There is no date set. It could be 2020. Is MJ Akbar a sexual predator?